Preserving the history of poor and rural women is a mission of the Iowa Women’s Archives, but it can be challenging because these women rarely leave detailed records of their lives. That’s why we were so excited to receive the papers of Viola Nesfield Owen, donated by Gary Whitehead. The collection contains dozens of letters between his grandmother, Viola Nesfield Owen, and her family, written from 1921 to 1963. 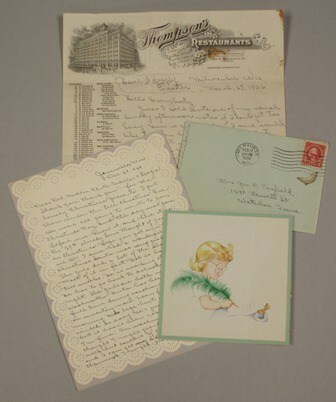 A few letters from the Viola Nesfield Owen papers. Viola was a high-spirited woman who saw her family through many hardships, and her letters give insight into how Midwestern women dealt with family, work, and financial hardships. Viola Nesfield was born in 1896. She grew up in Waterloo, Iowa, with her father, step-mother and two younger half-sisters. 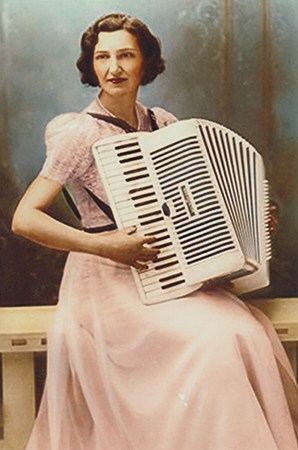 In 1921, Viola planned to marry Vern Owen. Since Vern was divorced, their engagement was somewhat scandalous for Viola’s family. Yet Viola and Vern were not to be deterred. They eloped and moved to Wisconsin. This is when the collection of letters between Viola Nesfield Owen and her family begins. The first few years of letters from the Nesfields to Viola are filled with appeals to return home and anxious parental advice. It’s hard not to admire Viola, who was sometimes called “Ha! Ha!” for her unquenchable good spirits. Her daughter, Betty, nearly died of kidney disease when she was two years old. Viola made a pact with God that if He spared Betty’s life, she would never complain about her hardships. It is evident in her letters that Viola tried hard to keep this promise, even though her family experienced dire poverty through the 1920s and 1930s. In 1927, the Owens moved into a tar paper shack in Janesville, Wisconsin, with no electricity or running water. Yet Viola’s letter bearing the news to her family reflected no bitterness. She mused, “We ought to save money here. No place to spend it.” (October 9, 1927). But the next month, Viola had found something to celebrate again: “I was so extravagant I ate a whole orange all by myself. Ha! Ha!” (February 2, 1933) During the 1940s, Viola found new independence. She started working for Parker Pen in Janesville, WI, and wrote excitedly about her various administrative duties at the factory. She also divorced her husband, but continued to care for him, especially after he suffered a stroke in 1948. Viola and her family continued to write each other, and the collection of letters extends to 1963. Audrey Altman, a graduate student in the University of Iowa School of Library and Information Science, processed the Viola Nesfield Owen papers while working in the Iowa Women’s Archives in 2011/2012. Viola became my (step)Grandma in 1951 when my dad married her daughter, Betty. I was the oldest (4 1/2 years old) of three girls whose mother died of polio in 1950. Grandma never treated us differently than any of her biological grandchildren. We all have so many wonderful memories of this very special woman! Laughter and love followed her wherever she went. We were all so blessed to have her in our lives!